It’s no surprise her expansive body of work would be fertile ground for a jukebox musical. Mirvish has brought the touring production of Beautiful – The Carole King Musical back to Toronto for a return engagement at the Princess of Wales Theatre. The show is based on the Jersey Boys formula; a by-the-numbers biographical script that details events in a popular music artist’s life while weaving in recognizable songs from their career. Beautiful traces Carole King’s (Chilina Kennedy) life from the time she started writing songs as a teenager in 1958 through to the recording of her breakthrough album, Tapestry, in 1971. Along the way, we witness her fractious professional and romantic relationship with partner and lyricist Gerry Goffin (Dylan S. Wallach) and their rivalry with song-writing duo Barry Mann and Cynthia Weil (Jacob Heimer and Alison Whitehurst). Staged song-and-dance production numbers of the two duos’ most famous songs are interspersed throughout the narrative. Credit to choreographer Josh Prince for the delightful period choreography of the “boy groups” and “girl groups” and to costume designer Alejo Vietti for the stylishly retro threads. The book (the scripted dialogue between the songs) by Douglas McGrath is a bit clunky, the pace is halting and it draws out the story in broad strokes with plenty of cheesy one-liners, but I’ve seen far worse writing for a jukebox musical. McGrath focuses on Carole’s journey of personal growth—finding her voice as a writer and building her confidence as a performer—as the character’s main narrative arc, however, I thought a bit too much of that development was defined by her relationship to Gerry with his infidelity being the central conflict in the script. Canadian actor Chilina Kennedy has performed the role of Carole King in over 1000 performances of Beautiful on Broadway since she took over the role in 2015. For this Toronto run of the show, Kennedy has taken a hiatus from the Great White Way to perform the role in her home town with the national touring company. From the moment Kennedy took the stage, I couldn’t take my eyes off her: she is simply radiant. After so many performances, Kennedy wears this role like an old glove, she knows the character inside and out. Every moment and each emotional beat of her performance comes off as sincere, and she sings with so much soul in this role. Kennedy doesn’t so much play Carole King as she embodies her completely. 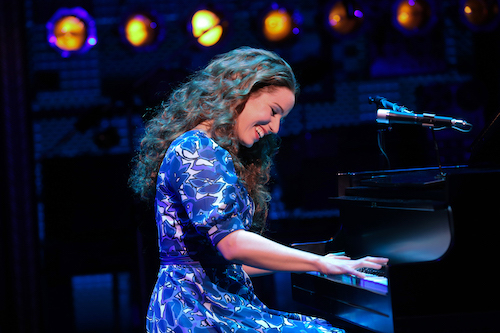 Beautiful – The Carole King Musical may be safe, formulaic fare but is it ever a crowd-pleaser. There’s a notice posted outside the auditorium asking audience members to refrain from singing and dancing during the show. It was needed; several audience members in my immediate vicinity could barely keep their enthusiasm contained as each new song started. I could scarcely blame them; Beautiful is thoroughly entertaining and Chilina Kennedy’s performance is pitch-perfect as Carole King. Shows run Tuesday to Saturday at 8:00 p.m. and Wednesday at 1:30 p.m., Saturday and Sunday at 2:00 p.m.
Photo of Chilina Kennedy by Joan Marcus.